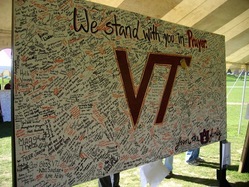 Students sign poster for Virginia Tech. One question has probably crossed every college student&#39;s mind in the last three days. We cannot begin to imagine what the community is going through, but we do know they stood strong in the face of terrible acts of violence. 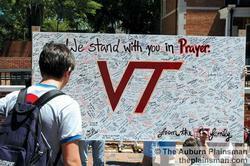 Auburn University shows its support for the victims of Virginia Tech. This memorial whiteboard was located at the Drill Field.